We always desire to have a Genie in our life who could fulfill our desires as 1-2-and 3 but this is mare an imagination of contemporary lifestyles where everyone is passing through lots of stress and to capitalize this human desire to have a magical hand that could solve our problems slot developers are always eager to offer such a product where players could relate themselves and imagine if they are having such a support in real life too. 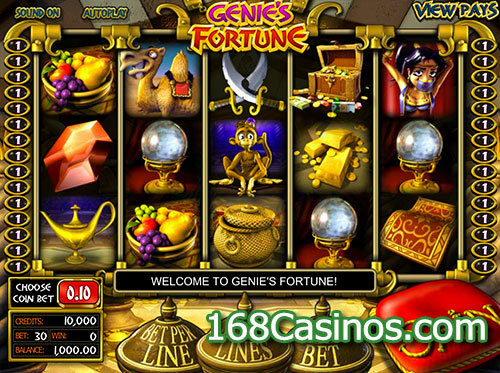 Genie’s Fortune Slot is one such online video slot which is based on popular Middle Eastern folklore about a Genie trapped inside a lamp. 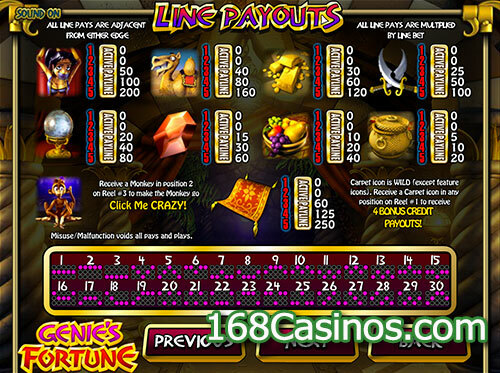 Genie’s Fortune Slot is precisely a five reels online slot that offers as many as thirty paylines betting option and not to forget there are lots of other luring features that make this game the most desirable in contemporary slot gaming. First, let us talk about its view appeal and if all the visuals are anyway related to the theme of the game. Definitely, Betsoft, the developer of this game, has done a hard work to encapsulate real Genie on slot canvas along with its related stuffs which are available here on the reel matrix. Notably, developer has not used true there dimensional visuals in this slot yet it offers a compelling experience every time a player lands the game or starts the roll. These days wagering condition in almost every slot game is too narrowed so that every player could play it irrespective of his bankroll size and this game is not an exception either. Anyone willing to check his luck on this game can start rolling the reels with as slow as two cents coin which can be as high as one dollar and since this is a thirty paylines game with up to ten coins wager each line, anyone willing to play with Bet Max can wager a big 300 coins per spin. Moreover, its RTP is also big enough to the tune of 96% so players could get the most share out of other players losing bets. If you are convinced with its features and have enough bankroll, which you should be, then start picking the base options like number of coins, paylines, and value of each of them. Last step is to hit the Spin and reels will start rolling to offer your final landing screen in few seconds. 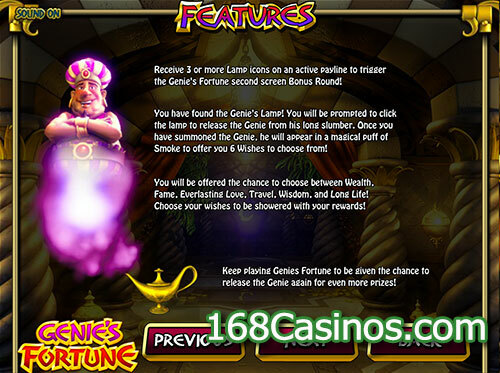 So, being a genie based slot game, players expect much higher from this one than other slot variants we have in the market and one of them is the Genie’s Fortune Click Me Game which is activated if you have three of the Magic Lamp Scatter Symbols on the landing screen. Herein, bonus game players will choose varying coin rewards behind any three (3) of the six (6) labels presented in the Genie’s Fortune Click Me Game and they are namely: Wealth, Long Life, Love, Fame, Knowledge, and Fortune. 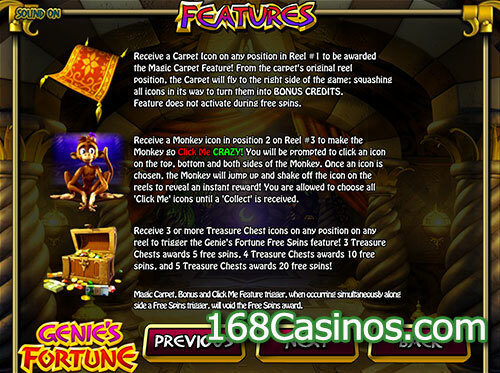 Apart from that if you have Treasure Chest symbol for more than three times on the landing screen, Free-Spins Bonus Game is activated where a player can win up to twenty free spins.